Isidoro Martinez de la Escalera (Barcelona, 1965) studied Engineering at the E.T.S.I.I. of the Universidad Politécnica de Madrid and has a PDD (Management Development Program) from IESE Business School. 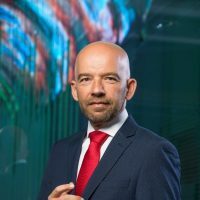 He has held leading responsibilities in the areas of General Management and Marketing in multinational companies operating in the fast moving consumer goods sector such as, Procter & Gamble , 20th Century Fox H.E, Pepsi, Antena 3 or Grupo Osborne. Isidoro has also developed a career as digital entrepreneur in the role of founding partner of the PR agency QMS and in the digital marketing agency, MultiPlatform Content. Martinez de la Escalera joined NH Hotel Group in 2014 as Chief Marketing Officer where he is currently responsible for leading the Company’s global marketing and online sales channels strategy. Furthermore, Isidoro is a member of the Board at Biosearch, a listed company on the stock exchange market of Madrid and has taught in several prestigious institutions such as Instituto Superior para el Desarrollo de Internet (ISDI) or the Universidad de Nebrija. He published the novel “Humo en la lluvia” in 2010.